No matter how many projects I have on the needles, somehow it seems they all finish at once. I usually like to split things up in to smaller pieces, but just for today, here’s a monster post to get us (mostly) caught up. I love the way the lace flows in the design, but when I tried it on, it looked a little too stretched for my taste. The sweater does fit, but it’s a little tighter and a tiny bit shorter than I wanted. I’d figured out the sizing based on what I thought I could get from the yarn I had, and I came pretty close to using it up. I don’t think I could have squeezed another vertical lace panel in there if I’d tried, but that’s what it would need to fit me the way I wanted it to. 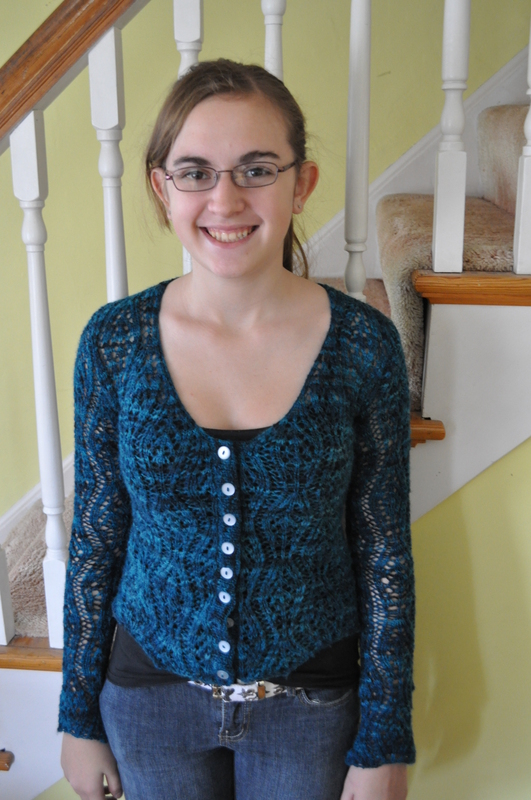 But I love the sweater, so I hemmed and hawed and tried to convince myself that I’d wear it anyway. We’ve been down this road before. I knit something, love it, am sure I’ll wear it, but there’s this one little thing about it that bugs me. Then I think of someone else that might wear it. And it becomes theirs. Even if I don’t give it to them, I’ll never wear it without thinking that it would be perfect for them. Once I’ve seriously considered giving something away, I never wear it again. 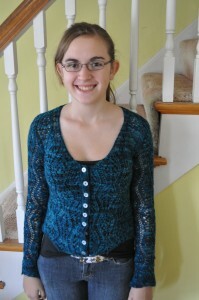 And so, the sweater went to my younger sister. She’s about three inches smaller than I am, which gives her just about the perfect fit. I was worried that she wouldn’t actually wear it (she’s at that tricky 14-year-old stage), but then it kept popping up all through our visit. I think she likes it. 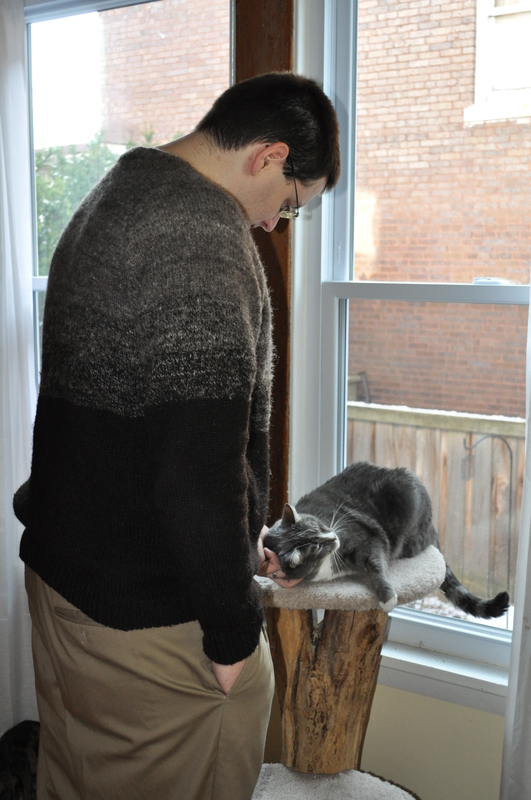 I had planned on knitting another version of this sweater anyway, in a commercial yarn to test the pattern when I eventually finish writing it. I was thinking of using something from Blue Moon Fiber Arts or Briar Rose, but then I saw the perfect color in a yarn from Madeline Tosh while we were poking around in a local yarn shop at home. The yarn is slightly lighter weight than I had planned, but the color is just what I was thinking, and there is enough of it. This is second (or possibly third) project in line on my knitting list for the new year. 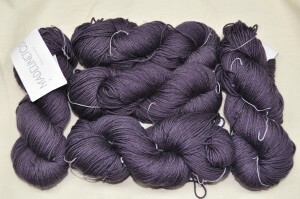 Just as we were about to leave the yarn shop, I spied something that was instantly added to the cart. 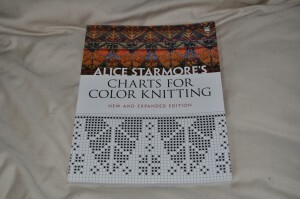 I have been stalking the Alice Starmore books for years, online, in used book shops, and on library wait lists. I couldn’t bring myself to pay $400 for them, but a couple have just been re-released by Dover. I knew they were coming, but I hadn’t seen them in the wild yet. I don’t make many instant decisions when it comes to buying crafty things, but this one was absolutely clear. I’ve barely had time to open it, but I am really looking forward to exploring these pages very soon. On the same day we took pictures of the lacy sweater, I managed to get a couple of Branden’s MacGyver sweater as well. 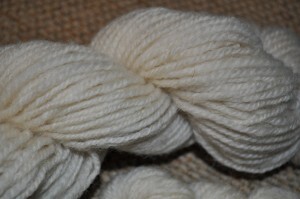 I am amazed at how warm woolen-spun shetland has turned out to be. 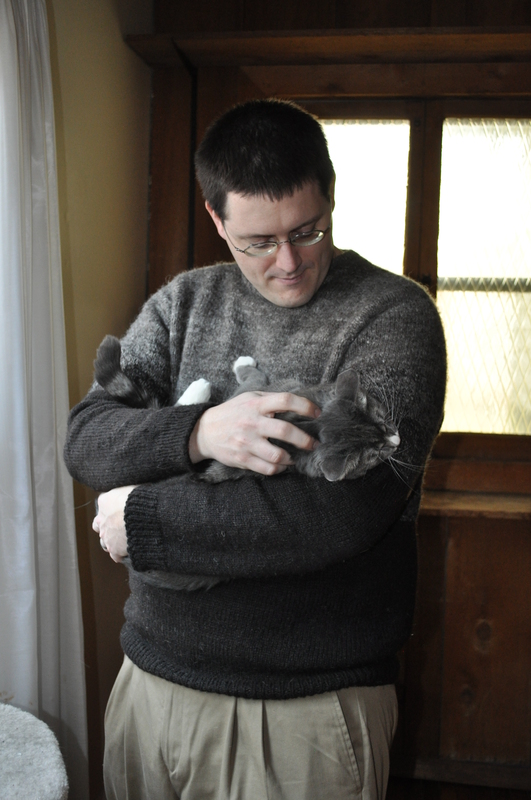 I had always heard that a low-twist, woolen-spun yarn is warmer, and having knit this sweater I definitely have to agree that it’s true. I think the non-commercial roving had something to do with it, too. You just can’t get that much loft out of a commercially processed top. My hand-combed Gulf Coast spun up lighter than anything else that I have done. I ended up with one skein for my friend, and another, smaller skein for Shelley (who doesn’t knit but raised the sheep). I can’t wait to spin the rest of this fleece, but there’s a lot of hand processing left to do before I get there. Another project to begin the new year. 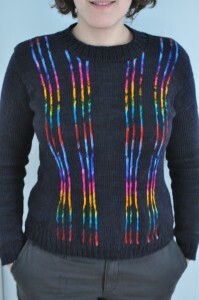 And then, this morning, I finished weaving in ends and put the neckband on the Bright Lights sweater. It still needs a steek and a zipper installed, but those need to wait until after it’s been blocked. I love the way the colors stayed in register the whole way through the knitting. I’m also pretty happy with the back accent stripe, though the upper sleeves are a tiny bit tight (which will block out), and so they pull the stripes and shoulder seam a little too far toward the upper arm in this photo. Here again, I’m glad I didn’t add any extra ease on the sleeves, because this is all I had left at the end of the project. I had hoped to cast on for my next project while we were home for Christmas, but the busyness of the holiday ensured that that didn’t happen. 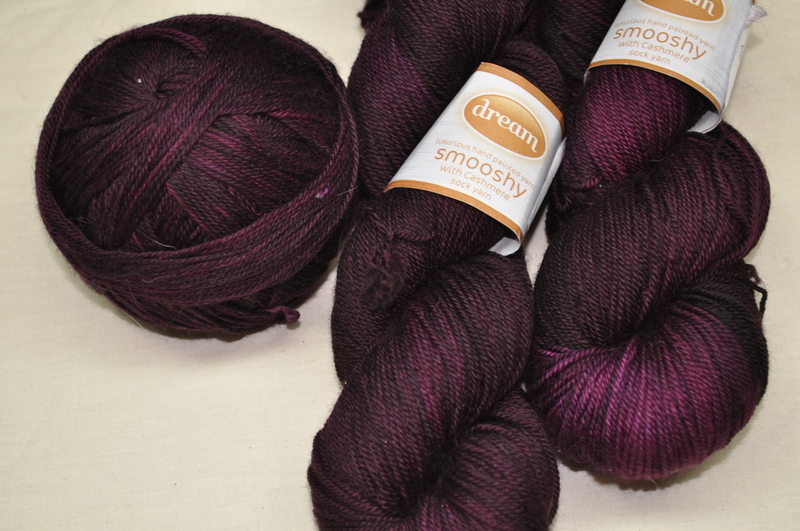 This is Dream in Color Smooshy (with cashmere) in the color Velvet Port. It is destined to become a long-sleeve version of a vest that I knit just before we left Seattle, two and a half years ago now. 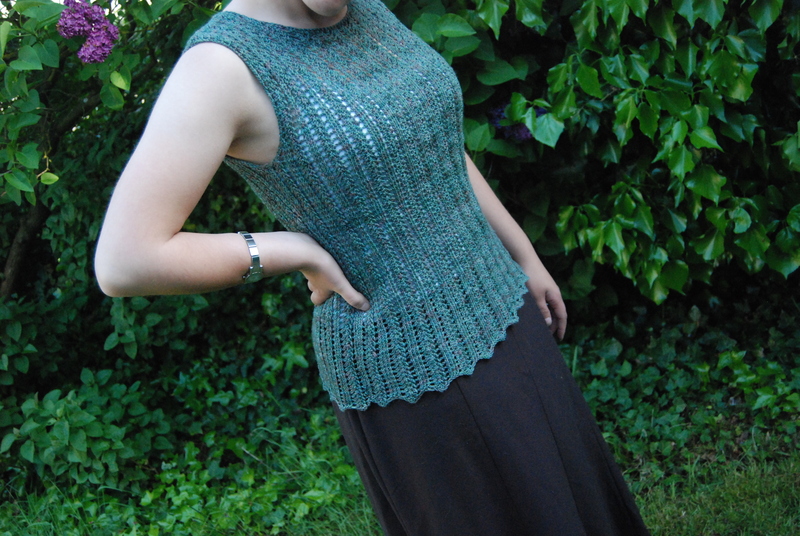 The new version will be my test piece for the first pattern that I’m writing up, and hoping to publish in the new year. So that’s that. A bunch of finishing, and some new things coming. I’m excited about re-knitting the two lace sweaters, and I’m hoping that will fuel my push to get the patterns written up. The first one was mostly done, but then I decided to tweak the way I’m writing it and now am back almost to the beginning again. I think the new way will be better and clearer, and possibly even easier to write than the old way, so the changes are good, even if they do slightly delay my casting on. As always, there is much to learn. 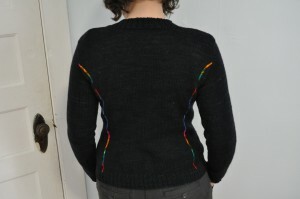 And now, I’m going to go soak the Bright Lights sweater so that I can start learning all about steeks and zipper installation. Wish me luck! 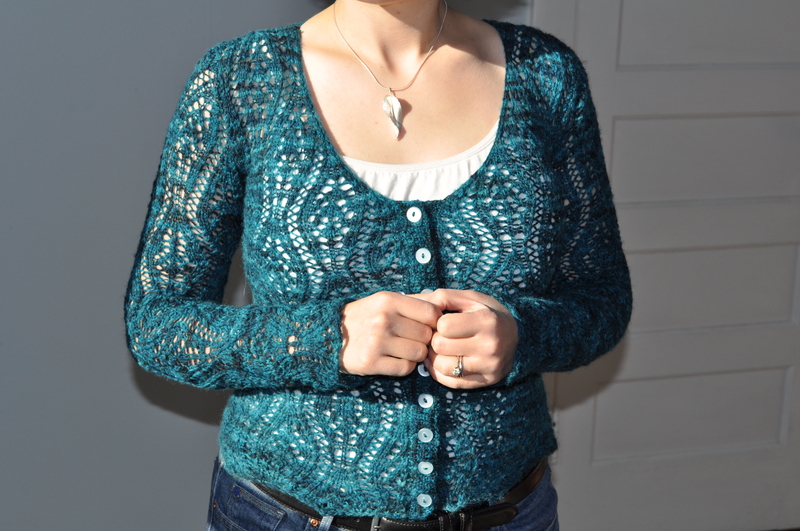 I love how the lacy Falkland Sweater turned out. I think it looks wonderful on your sister. If you ever decide to write up a multi-size pattern for this let me know, I would love to knit it! Branden’s sweater turned out great. I really like how the gradients worked out. 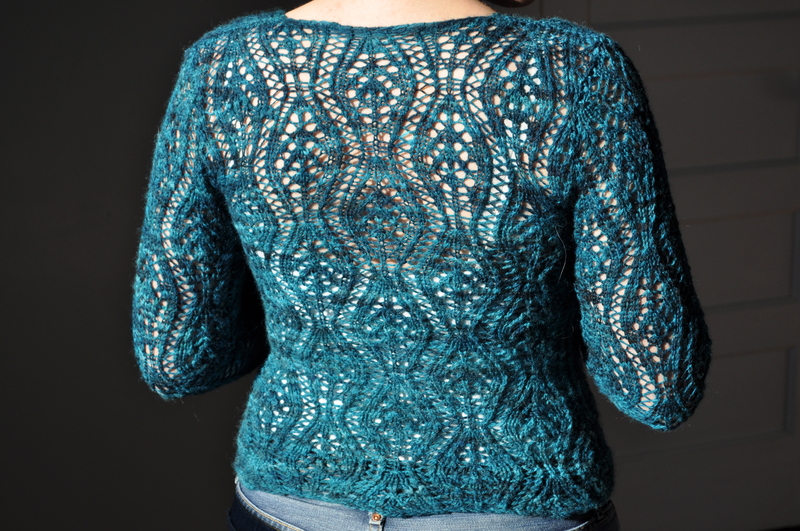 I love the contrast in the Bright Lights sweater. The colors are so bright and beautiful against the background of the sweater. I think the part I like best is the accent stripe on the back, it makes a wonderful shaping line. 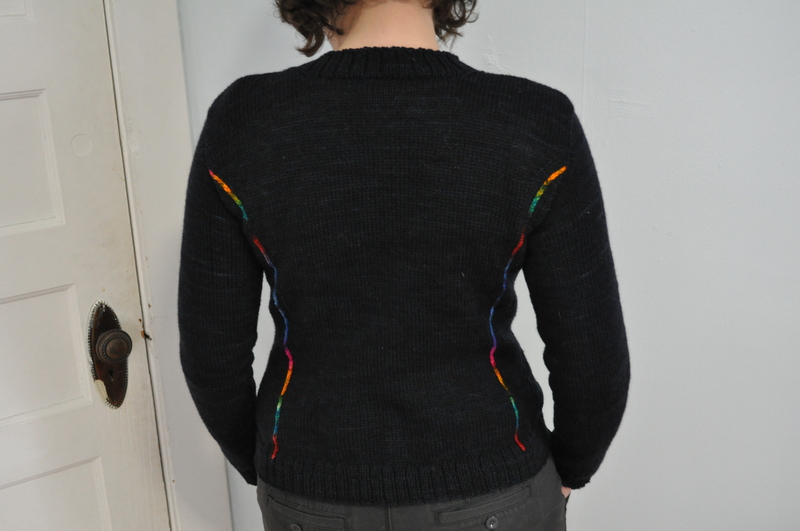 It’s making me want to knit up a dark sweater with brightly colored/rainbow colored stripes on the sides of the body and arms . . .hmm. What a great bunch of sweaters you’ve done! The Lacy Falkland is gorgeous and not too certain I would have been able to give it up even knowing that I wouldn’t wear it. Amazing how the progression of color on Branden’s MacGyver flows so nicely. And your Bright Lights, I adore how the back strips follow your silhouette. 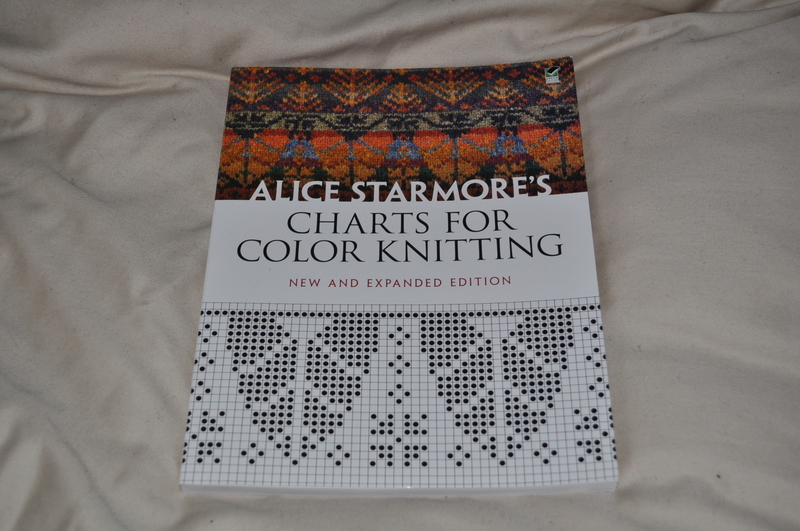 I only have one Alice Starmore book in my collection (Fishermen’s Sweaters) and it was purchased way before I knew who she was. Congrats on finding one of her books in the wild. Your judgement calls on all are exactly spot on!! Your sister is perfect for that sweater and Branden looks great in his. The Bright Lights sweater is already a knockouts. I foresee you almost living in that one! Happy New Year! Looking forward to more inspiration in 2012! Wow, so many projects finished, and they all look great. The lacy Falkland sweater is especially lovely. I’m glad you were able to find a happy recipient for it! 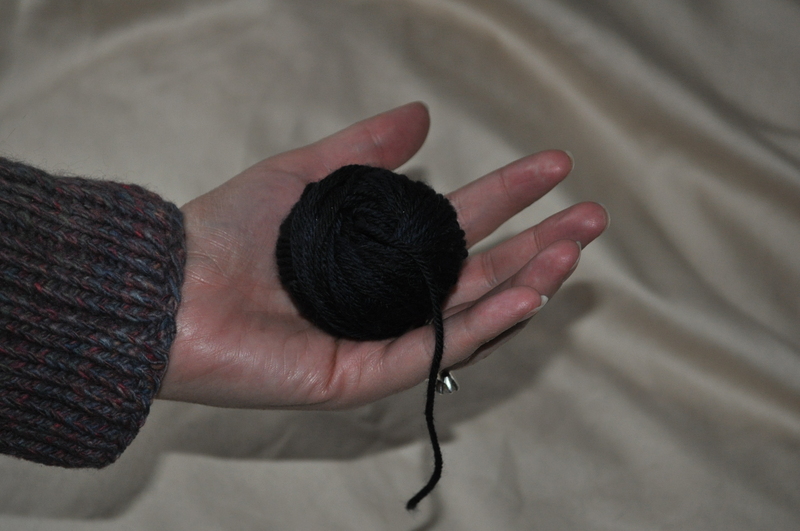 And the yarn you found for version 2 is absolutely lovely as well. Good luck with the steeks and zipper and Happy New Year! All of the sweaters are perfect for their models! 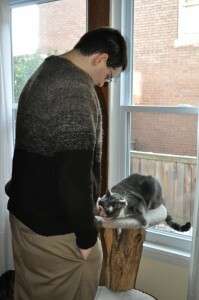 It is so nice to see Brandon and your sister enjoying their sweaters, and I am tickled to pieces by the Bright Lights. Such a good technique. DesigKnit is powered by	WordPress 4.8.9 . Page generated in 0.290 seconds using 45 queries.